For many, fishing is one of life’s ultimate pastimes. If you’re not familiar with it, you might think – what’s so thrilling about fishing? You might even think that it looks boring. However, you would be wrong. A love for fishing is simply an acquired taste. In order to grow to like it, you have to be good at it, and to be good at it, you have to invest some time and hard work into it. If you’re just beginning, you’re in the right place. 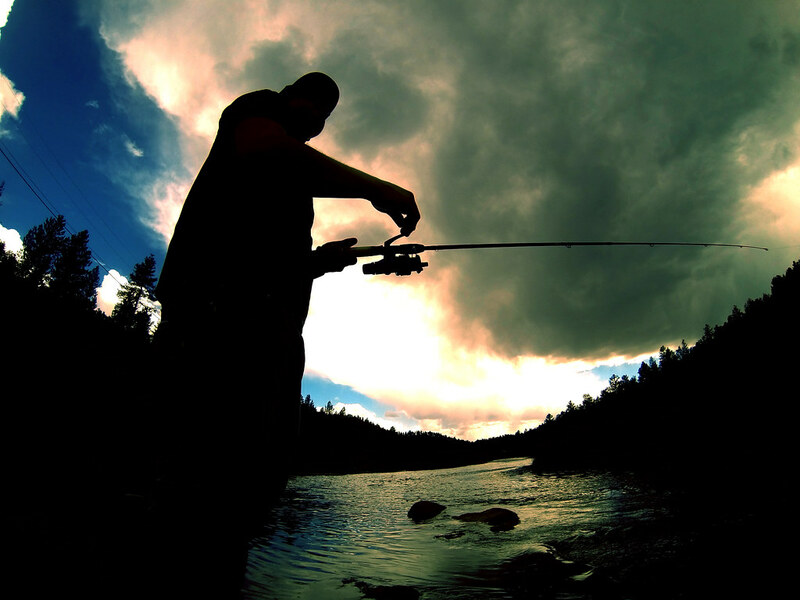 Here’s how to set up your fishing pole and start your watery adventure. To set up the most basic of fishing poles, you will need only these five things: fishing rod, line, reel, lure and scissors. The first thing you will be needing is a proper fishing rod. How to choose one? If you’re just beginning, there’s no need to ponder over this too much. All you need to do is find the one that best suits your hands. On the other hand, if you want to take a look a bit further into the future, there are three main aspects to think about when choosing the right rod: power, action, and length. Rod power refers to the amount of force necessary to bend the pole. If you are going to catch heavier or lighter fish, you might need a heavier or lighter rod, respectively. The second characteristic is action. This means how quickly the tip of the rod will bend and where. This is mostly connected with the baits. The slower bending rods are best for lighter baits and the faster ones are for heavier baits. Finally, there’s length. According to some of the professionals in the field, the longer the rod is, the more control you will have over the fish. Your perfect lure depends a lot on what you’re trying to catch. Lures come in various shapes and sizes, so you have a huge choice before you. Plastic worms are best used when fishing for largemouth bass. When fishing for trout, use flies. If you’re just starting and can’t decide yet, use one of the more universal lures like spoons, jigs and crankbaits. They all have their characteristic movement, so it would be a good idea to research them all gradually to gain a better insight into how they work. That being said, spinnerbait could be your best bet for now, since it is a mighty lure, with great attracting power. As for the color and shape, the basic idea is to make sure that they match the weather conditions and time of the day. The first thing you should do is put the fishing line onto the reel. Take the line and tie a small knot on it. It will act as an obstacle, preventing the line to come off. Open the Bail Arm on the reel. As you tie the line around the reel, you will make two knots and, ultimately, form a slipknot to tighten it around. Close the Bail Arm, then use the reel handle to wind the line around it. It is usually a good idea to place your hand higher on the rod, in order to make sure the line is tight as it is being spooled. A loose line might lead to complications later by becoming tangled and unusable. Fill the reel up, but make sure not to overfill it. Once you’re done, cut the line and place it on the line clip on the side. After that, adjust the entire reel to the rod, screwing it firmly. Open the Bail Arm on the reel to let the line go and pass it through the line guides on the rod. Once there’s about a 3 feet of line, close the bail arm and attach the lure at the end. That’s it! Before setting off on a fishing adventure of your lifetime, do the research. Find out what you want to fish and see where it can be found at certain time of the year. Once you’ve decided on the fish, choose your lure and bait accordingly. Nearly all types of fish have their own favorite bait, so you wouldn’t want to attract a wrong kind. Also, don’t forget to check the weather conditions. This is not only so that you would know what to wear and not to get wet, but also because at certain conditions some fish might be more difficult to catch or even find. Don’t forget to protect yourself from bugs beforehand (mainly those bloodsucking mosquitos) and don’t forget to bring food (unless you plan on eating exactly what you catch, which might be great motivation, to be honest). This is pretty much all you need to know to start tackling these water creatures. Remember, even if you’re not that good at it, you will become increasingly better with time. So, get your boots on and dive in!